Thanks for the review. I have been wanting to grab this book but didn’t realise the ego Tim was carrying around with him…. so it makes me more dubious but I still want to read it. LOL. When first reading, I was actually disappointed at capturing my attention. But I am glad that I continued to read it, as there is some good info despite Tim’s tude. Let me know what you think of it. Might, huh? You’re right no kids, etc… that was my thoughts. He’s a single guy roaming the world. But, I have to say, that working the exercises in this book I’ve made good time for myself and for my family. I guess a re-lesson in time management. Doesn’t hurt to be realigned sometimes. Thank you. Now its all about maintaining the new status quo of this book. LOL. I feel exactly as you do, “maybe with just a bit more compassion”. Plus, he is a marketing genius. Viral marketing with blogs and twitter. Has me writting about it. LOL. Was it you that quit your job? How is that going for you? Loved this book. It gave me the kick in the pants I needed. That is a good way of putting it. It is a book that kick starts one out of the rut. I needed that, too. I look forward to reading about the progress of your escape plans you and Nixon have planned. I have the idea of potentially justifying my reasons for outsourcing. Now I just need to formulate how I am going to construe the content of the post. Have you ever read Laura Langemeier’s book? Her reasons justify my idea for outsourcing. I am a bit Dave Ramsey, too. But am trying to expand my ways of thinking, potentially making me wealthier. 🙂 Will update soon! I’ve not heard of Laura Langemeier. Will look her up. I hate to admit I’m ‘dave ramsey’ at all, but I used to be a big fan before he became such an arse. I used to listen to him in the early 90’s when he was only on local radio and was a lot more humble and….nice. But, what he says works and partly because of him (mostly because I hate owing anybody money) I don’t have any debt so there you go. Good luck. To everyone who is turned off by the title, you’re missing the point. Go to your local bookstore and read the first two chapters; if you’re not immersed, that’s fair, drop the book. I resisted the book for months, then all I did was read a couple of pages and it was over! I had to read the book to the very end. In fact, I bought the second edition as soon as it came up. If I can reduce my work hours from 40 to 30 or 20, wth, that’s still awesome. I want to do more than just that and he explores those options. I won’t say that it’s as easy as it looks though, but I think with enough dedication and hard work, we can all strive towards what we want. Thank you for your input. And you are right on all accounts of your review. Just as much, I look forward to following your progress. 🙂 You’re gonna make it! I appreciate your honest and personal appraisal of this book. I had a similar reaction to the voice in which it was written although I also acknowledge there are some great points made. 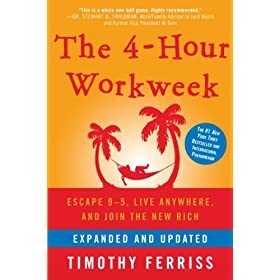 For people who really get into the idea of decreasing your workload, becoming more efficient and taking on a nomadic existence, know that there are many people out there who have been living this way even in pre-4hww times. There is a lot on the web written by these pioneers and many examples you can choose from if Ferriss’ template doesn’t fit your particular style. Hi Carmen, Thank you for stopping by. I love the blog! And am happy to find there are so many others living the lifestyle. Now if I can only get my husband to see the light! It is a decent message. And I liked that he put in about spending more time with your kids. So, it did relate to me. But it could be abit more toned down. LOL. Refocusing Time management to fulfilling it with the important aspects did work. I have to admit it was an easier book to read than to implement. Perhaps it was because I am an 80/20 kind of guy already, and had already mopped up a lot of the low-hanging fruit. When I read it in 2007 I think I’d be living very differently by now… but truly passive income is non-trivial to acquire!